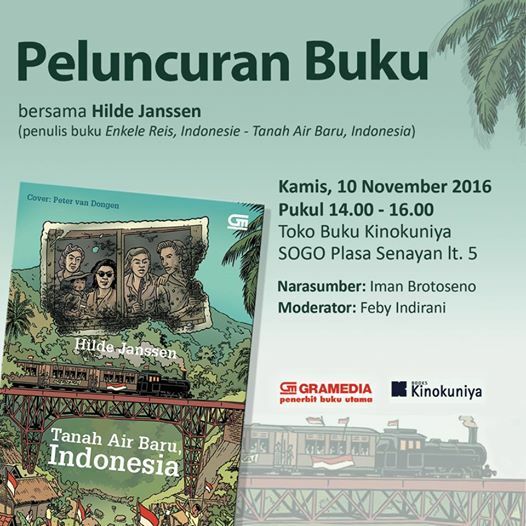 On 10 November, Indonesians Heroes Day the Indonesian edition of my Dutch language book ‘Enkele reis Indonesie” will be officially launched in Jakarta, in Plasa Senayan at the Kinokuniya bookshop, by Gramedia Publishers. Earlier this week I attended several presentations and lectures in Jakarta and Semarang. Focussing on the ‘small’ family history of four Dutch women and their Indonesian husbands, their personal stories are being placed in a broader context of the history of Indonesia, it independence struggle against the Dutch coloniser and the growing pains of a young nation. In Jakarta and Semarang we had some lively discussions with students and history lovers on the unknown history of Indonesia, and the way it is presented in the book, based on oral history research combined with archive research, but written in an easy accessible style. While Dutch readers already had a change to read the book, now most of the family members and Indonesian friends of the four Dutch women can finally read their own family history. The first responses are hearth warming, although it is not always easy for some children to read about the hardship their mothers went through. But still, they are happy they finally learn more about the untold family history.